Arthur Edward Blacknell was born in 1891 in Arnold, Notts2, the third of five surviving children of Albert E Blacknell and his wife Annie (née Holland). Albert worked as a colliery banksman and was living with his family at Cross Street in Arnold, Notts in both 19013 and 19114, by which time Arthur, aged 18, was working as a threader in the lace trade. The photograph of him (left) would be from this era. In November 1911, Arthur married Olive Lander, the daughter of Thomas & Alice Maud Lander, of Sherwood. Arthur, their son, was born in the following March and their daughter, Olive, was born early in 19155. As Arthur's Service Record has not survived we do not have the exact date of his enlistment, but it appears that he enlisted very early, in September 19146, originally with 10th Battalion, West Yorkshire Regiment (Prince of Wales Own), at the time it was formed at York in that month. After initial training in England as part of the 50th Brigade of 17th Division, the Battalion was assigned first to Home Defence duties before this decision was reversed and it was mobilised for war. Arthur was with the battalion when it landed in Boulogne on 14 July 1915 but was, at some point, to transfer to 11th Battalion which arrived on the Western Front at the end of August 19157. Because of the uncertainty as to when Arthur was transferred between battalions, it is not possible to describe his involvement in actions prior to 1917, when we can perhaps assume he was with 11th Battalion. What we can be sure of is that, like all men on the Western Front, he would have had a terrifying and unpleasant time, in almost constant danger. He is clear that he acquitted himself well as at some point he was promoted to Lance Corporal and was awarded the Military Medal for bravery in battle8. However, it is likely that Arthur was with 11th Battalion by the last day of July when the three-month long series of bitter battles which made up the Third Battle of Ypres - also known as Passchendaele - was under way, with 11th battalion taking a full part in both the Battle of Menin Road and the Battle of Polygon Wood towards the end of September. The hard-fought Menin Road attack went largely according to plan and most objectives were achieved. 11th Battalion took Inverness Copse but at a heavy cost - 4 officers and 60 other ranks killed or died of wounds and 3 officers and 221 other ranks wounded. In the days that followed the area was heavily bombarded by enemy gas shells and, as well as 17 men who had been gassed being sent out of the line, six more were killed and two wounded. It is likely that Lance-Corporal Blacknell was one of those killed at that time9. Lance Corporal Blacknell was buried originally as an unidentified soldier, alongside other fallen comrades, near where they fell. Over eleven years later in October 1928, their remains were exhumed and reburied in Sanctuary Wood Cemetery10, which is located 5 Kms east of Ypres. Sanctuary Wood is one of the larger woods in the commune of Zillebeke. It was named in November 1914, when it was used to screen troops behind the front line. It was the scene of fighting in September 1915 and was the centre of the Battle of Mount Sorrel, in June 1916. involving the 1st and 3rd Canadian Divisions. 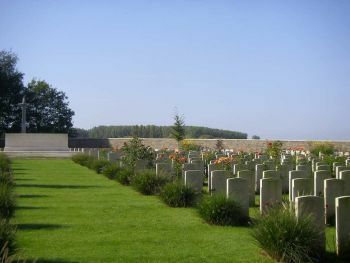 There were three Commonwealth cemeteries at Sanctuary Wood before June 1916, all made in May-August 1915. The first two were on the western end of the wood, the third in a clearing further east. All were practically obliterated in the Battle of Mount Sorrel, but traces of the second were found and it became the nucleus of the present Sanctuary Wood Cemetery. Graves were brought in from the surrounding battlefields, mainly from the area immediately surrounding Ypres and a number of smaller cemeteries. There are now 1,989 Commonwealth servicemen of the First World War buried or commemorated in the cemetery. 1,353 of the burials are unidentified11. Arthur was posthumously awarded the 1915 Star, British War and Victory medals12. Arthur's financial effects of £4 1s 2d were paid to his widow on 28 December 1918 and she also received his War Gratuity of £13 10s on 8 November 191913. By the end of the war it appears that Olive Blacknell's parents and some of their family had moved to 28 Chapel Street, Beeston14 and it is probable that Olive and her two children retreated there for a while. In 1919, however, she appears to have agreed to marry Arthur Martin, also from Arnold and probably someone she had known from the past who had, by then, established himself as a farmer in Saskatchewan, Canada. Arthur's elder brother, Samuel Martin had been the first in the family to leave for Saskatchewan, had established himself as a farmer and had married there in 190615. Saskatchewan was then Canada’s fastest-growing province and this was to continue for some time, with 303,000 homestead entries in the 30 years up to 1930, a ten-fold increase in its population, from 91,000 in 1901 to 932,000 in 1936 and the number of farms growing from 13,000 to over 142,000. Communities developed, usually where none had existed before, to serve the agricultural industry and the farm population16. No doubt encouraged by Samuel, Arthur had, by the beginning of the war, also emigrated there and had started to establish himself as a farmer in Newbank, Saskatchewan. But the war in Europe dominated and, in January 1916, he enlisted with 46th Canadian Infantry, left for France in the same year where he served until the end of the war and returned to Canada to be discharged in January 191917. Olive, having agreed to join him there, left, with her two children, for Canada, on the 'Corsiva' out of Glasgow on 21 October 191918. Olive and Arthur appear to have married upon arrival and they began their life together on their homestead farm at Birsey, Saskatchewan. In November 1920, their daughter Elsie was born and later, their son Bert completed their family. The family moved to Eston District in 1930. There, life on the farm, in a small community, would not have been easy and things got very tough during the Depression years of the 1930s when farming was hit by both drought and economic collapse. Daughter Elsie, who died in 2010, had described those difficult years, telling how, as a child, she had to gather cow chips for heat, milk the cows and ride a horse to the one-room school at nearby Centerfield19. The War Effort during the Second World War helped bring economic recovery and the years that followed brought relative prosperity. In 1948, Olive was able to travel to England for a two month visit to her parents at Chapel Street, Beeston20. Her father died in 1957, followed by her mother in the following year21. Arthur Martin died after a fall in 1983, aged 93. Olive died in 1987, aged 9522. In addition to his entry of the memorial in Beeston Parish Church, Lance Corporal Blacknell is also remembered on the Arnot Park War Memorial in Arnold and the memorial in St Mary's Church in Arnold, Notts. 2His birth was registered in Basford Registration District (of which Arnold was part) in Q3 1893 (Ref 7b 244). 3Arnold, Notts, Census, 1901 - Piece 3158 Folio 155. 4Arnold, Notts, Census, 1911 - Piece 20450 RD429 SD5 ED4 Sched 257. Arthur's two younger siblings were also present : Ernest (b. c1903 & Alice J (b. c1904). Older siblings were Samuel (b. c1882, who had emigrated to Canada), Frederick (b. c1883) and Edith A (b. c1885). 5Their marriage was registered in Nottingham Registration District in Q4/1911 (Ref 7b 583), believed to have been in Carrington Church on 18 November 1911. Their son, Arthur L's birth was registered in Basford Registration District in Q2/1912 (Ref 7b 512) and daughter Olive's birth was also registered there in Q1/1915 (Ref 7b 547). 6This date has been calculated based on the amount of his War Gratuity. 7The battalion's deployment (and that of 11th Battalion) is described on the Forces War Records website at www.forces-war-records.co.uk/units/3532/west-yorkshire-regiment. The date of 10th Battalion's arrival in France corresponds with Arthur's arrival as recorded on his medal card. 8His award of the Military Medal is recorded on his medal card and in 'Soldiers Died in the Great War'. His promotion to Lance Corporal may have been just before he was killed as his stripe was found in his pocket when his body was exhumed. 9Description of the actions and casualties are based on the account in the Battalion War Diaries. 10The report on the exhumation and reburial, dated 29 October 1928, is associated with Arthur's Commonwealth War Graves Commission record. 12Details of his medal awards may be found on his medal card and medal rolls on ancestry.com. 13Details may be found in the Army Register of Soldier's Effects on ancestry.com. 14Thomas and Alice Maud Lander and their son James are recorded at this address in the 1921 Electoral Roll. 15Samuel was born in Arnold, Notts in 1882 and died in Saskatchewan in 1979. 16Population and farming statistics from the Encyclopedia of Saskatchewan website (http://esask.uregina.ca/entry/farming.html). 17Arthur's Attestation Record, overwritten with his discharge date, may be found in the WW1 CEF Attestation Papers on ancestry.com. 18UK, Outward Passenger Lists, 1890-1960, available on ancestry.com 19Details from the obituary of Elsie Black Ducker (née Martin) from the Saskatchewan Cemeteries Projects, obituaries of residents and former residents of Weyburn, Saskatchewan. It can be found to Elsie Martin's record in The Strong Family Tree on ancestry.com. 'Cow chips' are better known as cow pats in Britain. 20She sailed in the Empress of France in each direction, arriving at Liverpool on 30 October 1948 and leaving from there on 22 December 1948. 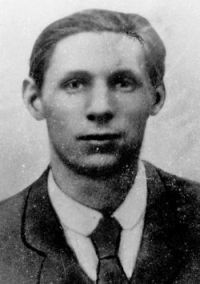 21Thomas Lander died in Beeston on 2 July 1957 (Probate Calendar). Alice Maud Lander died in Nottingham General Hospital on 13 February 1983. 22Arthur died on 5 November 1983, age 93 (Cemetery Transcript on ancestry.com and letter received by her niece, Vera Heard (née Blacknell) from Olive Martin). Olive died on 29 March 1987 (Entry in Vera Heard's diary). Olive kept in touch with her family in Beeston, including Vera, up to her death. Vera's parents were Frederick Blacknell (c1883-1958), a brother of Arthur Edward and Clara Alice Blacknell (née Lander, 1896-1957), a sister of Olive. I am grateful to Will Heard, Vera's son, for making these details and the photograph of Arthur, available.